Definition at line 203 of file llfollowcam.h. Definition at line 232 of file llfollowcam.h. Definition at line 235 of file llfollowcam.h. Definition at line 677 of file llfollowcam.cpp. Definition at line 881 of file llfollowcam.cpp. References llendl, llinfos, S32, and sParamStack. Definition at line 838 of file llfollowcam.cpp. Referenced by LLAgent::changeCameraToDefault(), and LLAgent::updateCamera(). Definition at line 819 of file llfollowcam.cpp. References NULL, params, and sParamMap. Referenced by removeFollowCamParams(), setBehindnessAngle(), setBehindnessLag(), setCameraActive(), setDistance(), setFocus(), setFocusLag(), setFocusLocked(), setFocusOffset(), setFocusThreshold(), setPitch(), setPosition(), setPositionLag(), setPositionLocked(), and setPositionThreshold(). Definition at line 874 of file llfollowcam.cpp. Definition at line 865 of file llfollowcam.cpp. References FALSE, getParamsForID(), params, setCameraActive(), and sParamMap. 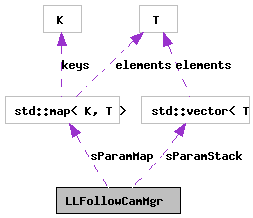 Referenced by LLViewerObject::markDead(), and process_clear_follow_cam_properties(). Definition at line 759 of file llfollowcam.cpp. Definition at line 769 of file llfollowcam.cpp. Definition at line 849 of file llfollowcam.cpp. References getParamsForID(), params, and sParamStack. Referenced by LLVOAvatar::detachObject(), LLVOAvatar::getOffObject(), process_set_follow_cam_properties(), and removeFollowCamParams(). Definition at line 729 of file llfollowcam.cpp. Definition at line 789 of file llfollowcam.cpp. Definition at line 698 of file llfollowcam.cpp. Definition at line 809 of file llfollowcam.cpp. Definition at line 749 of file llfollowcam.cpp. Definition at line 708 of file llfollowcam.cpp. Definition at line 739 of file llfollowcam.cpp. Definition at line 779 of file llfollowcam.cpp. Definition at line 688 of file llfollowcam.cpp. Definition at line 799 of file llfollowcam.cpp. Definition at line 719 of file llfollowcam.cpp. Definition at line 233 of file llfollowcam.h. Referenced by cleanupClass(), getParamsForID(), isScriptedCameraSource(), and removeFollowCamParams(). Definition at line 236 of file llfollowcam.h. Referenced by dump(), getActiveFollowCamParams(), and setCameraActive().